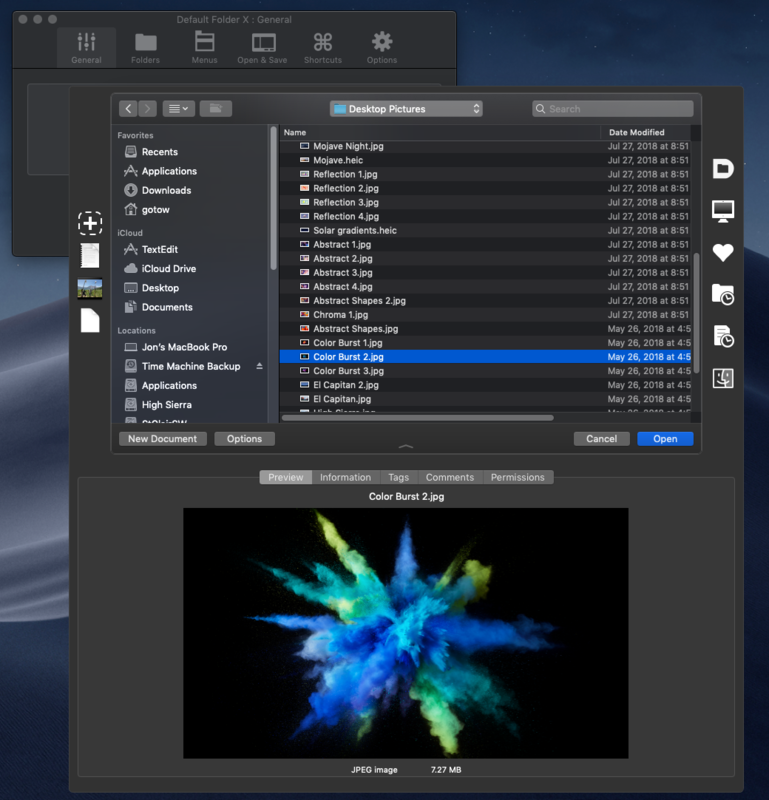 Version 5.3 of Default Folder X didn’t quite get it right with respect to some changes in the Mojave Finder: Its Finder-click feature omitted windows that contained multiple tabs. 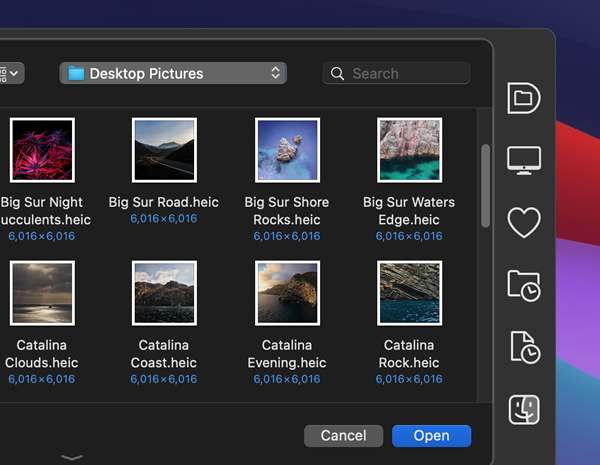 This release fixes that – if you use tabbed Finder windows in Mojave, Default Folder X will now list the windows as it should in its Finder window menu and will recognize them when you click on them. Default Folder X 5.3.1 also resolves a couple of crashes (on all versions of macOS) and makes Default Folder X’s exclusion list apply to files that you’ve recently opened as well as excluding Default Folder X from that app’s Open and Save dialogs. You can grab the new version on the Default Folder X Release page. 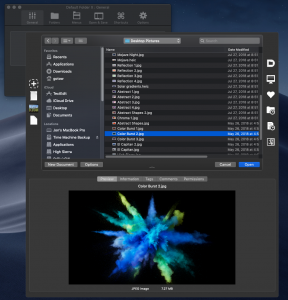 App Tamer and Jettison have both been updated with support for Dark Mode in Mojave. Jettison 1.7 also includes a number of features and fixes for all versions of macOS (well, from 10.8 to 10.14, anyway — that’s what Jettison supports). 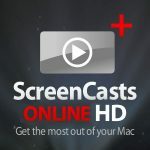 These include the addition of a menu command to mount all unmounted disks, options to not automatically remount specific drives after they’ve been ejected, and the fix for a bug that could cause some Macs to repeatedly cycle between sleep and wake. There are also a number of under-the-hood improvements and fixes. Details and download links are available on the Jettison Release Page and the App Tamer Release Page — or you can just hop over to the Products Page and download them both! There’s a new public beta version of Default Folder X available – it’s Default Folder X 5.2.6b7. You’ll want it if you’re running Mojave 18A384a or higher, as the new Mojave builds require “usage statements” built into applications as part of their privacy controls. Previous betas of Default Folder X didn’t have these, resulting in newer iterations of Mojave summarily killing it if it tries to access protected folders, like those containing your contacts or music. This Default Folder X build also includes a bunch new dialogs to alert you when it hasn’t been given adequate access to things in System Preferences > Security & Privacy > Privacy. 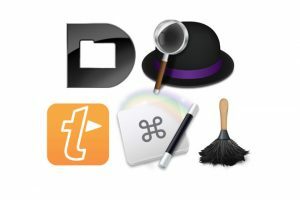 The biggest stumbling block is access to Automation — giving DFX permission to use AppleScript to talk to the Finder, Path Finder, ForkLift and System Preferences. DFX uses AppleScript to get lists of open windows and navigate to folders and files in Finder / Path Finder / ForkLift, as well as opening System Preferences to the right preference pane so you can update necessary settings. 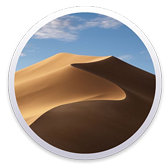 While there’s definitely a need for Mojave’s increased security, it’s a bit piecemeal at present. I’d love it if Apple would provide developers with some sort of API to help inform users in one shot of everything that an application needs access to, and to help them configure that access conveniently. As it stands right now, you’ll encounter multiple alerts as you use Default Folder X — they pop up in the middle of whatever you’re doing when Default Folder X first tries to touch something that’s protected. They’re not terrible, but they interrupt what you’re doing and, as such, aren’t presented at a time when you’re likely to devote your full attention to the security choice you’re being asked to make. So be prepared for a few alerts when you first start using Default Folder X in Mojave — it’s now the price we pay for additional security. Oh, and on top of all the security shenanigans, Default Folder X 5.2.6b7 also tracks your recently used files much more effectively, even if the Recent Items system in macOS misses them. Something I’m happy to have finally sorted out! Release notes and a download link are on the Default Folder X beta testing page. App Tamer 2.4 hides idle apps, makes its CPU usage graph optional, and more! App Tamer 2.4 is now available. 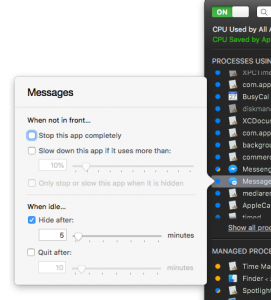 It offers a new option to hide applications after they’ve been idle, and also lets you hide its CPU usage graph if you just want to see its lists of CPU-consuming processes. There are also fixes for several bugs, including one that could result in App Tamer not correctly slowing (or un-slowing) an app if you had the “Do not slow or stop apps if power is plugged in” option turned on. As an additional note, App Tamer works with beta versions of Mojave, but it doesn’t yet support Dark Mode. However, you can switch App Tamer to its own dark appearance and that makes its main window match, at least. A complete list of changes and a download link are on the App Tamer release page, or if you’re already running App Tamer, you can just choose “Check for Updates” from the menu in the lower right corner of its window.